NO ARRIVALS ON A SATURDAY. Contemporary split level 4 bedroom tastefully furnished home. 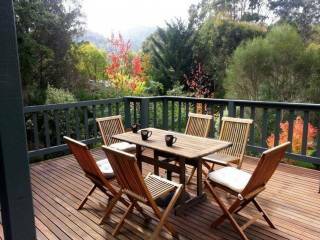 Pleasant views to Mt Buller and surrounding mountains. 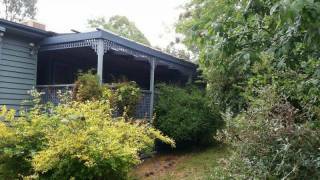 This is a perfect house for groups or large families looking for accommodation close to Mt Buller. Entry level features a walk-in drying room, one large living room with open fire. Continue up one level to another large spacious open plan living area with a well appointed kitchen, dining area with views of Mt Buller and large lounge room and Flat Screen TV. Sleeping areas are extensive with an upper level providing a King bed, plus a fold out, full bathroom with spa and separate powder room, plus study. Lower levels offer 1 x Queen bed with single and ensuite, another Double Bedroom and a further Queen bedroom with ensuite. Three of the bedrooms each have private ensuite and two have semi kitchens ie microwave and fridges and tea and coffee making facilities. Two of the bathrooms have spa baths. All bedrooms are set up with linen and towels. 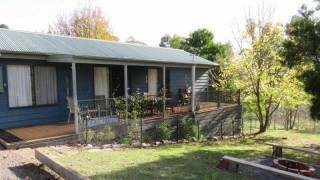 If you are looking for accommodation close to Mt Buller or Mt Stirling or just to relax and enjoy the many other things to do in the area Jarrah Lodge is the perfect escape. NO ARRIVALS ON A SATURDAY! IF A BOOKING IS MADE WITH AN ARRIVAL ON A SATURDAY IT WILL BE CANCELLED AND YOUR BOOKING FEE WILL BE REFUNDED. A 50% deposit is required at time of booking, with balance payable 30 days before arrival date. Full balance of payment is to be paid no later than 30 days prior to arrival date. There is a fully refundable bond – the bond amount pending property allocation, will be advised at time of booking. The bond shall be charged to a nominated credit card on day of arrival, and is refunded the following week after departure and servicing, upon condition of the property being in a clean and tidy manner. A cancellation fee of 35% of the total reservation will apply to bookings cancelled. A fee shall not apply to bookings where contact has been made 21 days prior to arrival and an alternative date has been selected for the booking. No refund shall apply to bookings cancelled less than 21 days prior to arrival date, or if balance of payment has not been paid by the arranged due date and contact cannot be made with the client.